Los Gallos Negros perform at a rally in front of the White House in Washington, D.C. on Thursday, June 21, 2018. In the long-running and contentious debate over immigration in this century, nothing has struck a public nerve in the United States like the news that children were being forcibly separated from their parents at the U.S.-Mexico border by order of a policy implemented by the Trump administration earlier this year. Social media and opinion polls screamed condemnation and sparked existential questions about national character, while hundreds of protests took place around the country days before the United States celebrated its independence. It didn't take long before politically engaged musicians were speaking up about the policy in both words and song. Strongly worded statements about the plight of Central American immigrants at the border came from the mainstream, from Bruce Springsteen to country singer Willie Nelson, rapper Common, and Puerto Rico's Luis Fonsi and Ricky Martin, among many others. They joined the many Latinx musicians who have been challenging Trump's approach to immigration and immigrants ever since the real estate mogul was a candidate in the 2016 presidential campaign. Earlier this month, Guatemalan musician Gaby Moreno lent her voice to the movement. Her shows in the United States are usually packed with fellow chapines, many of whom made the same arduous journey across the border that is central to the current debate. The song has a curious background: Written in 1998 by calypso performer David Rudder, it was penned in reaction to the infamous police beating of Haitian immigrant Abner Louima in New York City. Moreno adapted some of the lyrics to reflect the more recent wave of immigrants from Central America. Another way to join the chorus of protest is to, well, actually play for a protest. On a balmy late June afternoon, D.C.-based mariachi band Los Gallos Negros sang an impassioned chorus called "Migra" in front of 1600 Pennsylvania Ave., during a rally against what was President Donald Trump's policy of separating the children of asylum seekers from their parents at the U.S.-Mexico border; the organizers had asked the band to start the rally with a song. Bandleader Daniel Herrera says playing music for events like this is a deeply personal statement for all of its members. "All of us are children of immigrants, and this issue hits us very hard in a very guttural and emotional way," says Herrera. "So we wanted to be able to contribute any little piece of art that we have to this mosaic of social justice." One of the facilities being used to temporarily — and separately — house parents and children sits in Tornillo, Texas, between between Interstate 10 and the Mexican border, about 35 miles east of El Paso. Tornillo is also home to the Sonic Ranch, a five-studio residential recording complex that sits among 40 acres of pecan trees. It is a favorite of many Texas musicians, including David Garza, who was at the Sonic Ranch working on some recordings when a spontaneous demonstration at the holding facility quickly became part of the national dialogue. Garza says he grabbed a guitar and headed out to join the folks protesting. "I was strangely the only musician out there with all the other people," Garza says. "There were hundreds of people, eventually thousands of people, and one guitar. It was an honor to represent music like that." Garza says his march playlist included "movement" songs from the 1970s fight for Chicano civil rights in the southwest. "People wanted to hear everything, from the classics 'No Nos Moveran' and 'De Colores' — which is from the Cesar Chavez days of the '70s — to Tom Petty's 'I Won't Back Down' and 'Yo Soy Chicano,' another great '70s-era fight song," Garza says. "People just wanted to hear songs that make them feel like they are part of the fight." There have been many other non-Latinx artists besides Guthrie who have long devoted their music to the plight of immigrants from Latin America and the struggles they endure — Nashville-based country songwriter Radney Foster is one. Originally from Del Rio, Texas, near the border, Foster says that growing up there sensitized him to his Mexican neighbors. "We're not Latinos," Foster says, "but after four generations on the border, my father was adamant that every one of his children learn to speak Spanish, because he believed you couldn't make a living there if you didn't." In 1999, Foster wrote "Godspeed (Sweet Dreams)" for his son after they were separated by a custody dispute, with lyrics inspired by the children's book Goodnight Moon. He says the family separation policy moved him to revisit the song and release a new version, titled "Godspeed (Dulces Sueños)." "The whole situation — from a personal level, from a level of faith, from a level of humanness — everything about that seemed just wrong," Foster says. "And I feel that if we don't speak up, no one will. "I got the Spanish as far as I could; then I called my first high school girlfriend, Déborah Hernandez," he says. "She and I collaborated on really getting the Spanish right, and we really concentrated on making the lyrics about making an open-air dangerous journey with a small child." Foster's new lyrics are written from the perspective of someone who risks everything in the hopes of finding safe haven on this side of the border. Its second verse, originally about reading children books before bed, are now reimagined for a family in transit: "No tenemos libros en este viaje / Pero puedo cantar." ("We don't have books on this trip / But I can sing.") Proceeds from the song are being directed to the Refugee and Immigrant Center for Education and Legal Services, a nonprofit organization in Texas that provides legal representation for undocumented immigrants. The situation on the border resonates with guitarist and composer Marc Ribot personally. "I'm Jewish. Every year at Passover, we would pray," he says. We would remind ourselves: 'You must know the heart of the stranger, for you were a stranger once yourself in the land of Egypt.' "
Ribot is also no stranger to musical resistance, or to repurposing classic songs for a more current political context. Ribot's upcoming album, Songs of Resistance 1942 - 2018,is a musical reaction to the current political climate — not just in the United States, but around the world. "We understood that to mean that you have to show compassion to immigrants," he continues. "People that my grandmother and grandfather knew died because other countries wouldn't accept them. That is within living human memory. So what's going on at the border touched me personally and deeply." Songs of Resistance includes a cover of "Rata de Dos Patas," or "A Rat with Two Feet," a song made popular by the Mexican vocalist Paquita la del Barrio, a ranchera singer known for taking Mexico's sexist culture of machismo to task with biting lyrics. In his interpretation, Ribot directs the song's strong name-calling — of "rata inmunda" ("filthy rodent"), "animal rastrero" (despicable animal) "escoria de la vida" ("scum of humanity"), "adefesio mal hecho" (deformed monstrosity), among many others — at President Trump. "I thought it would make a very relevant political statement," Ribot says. 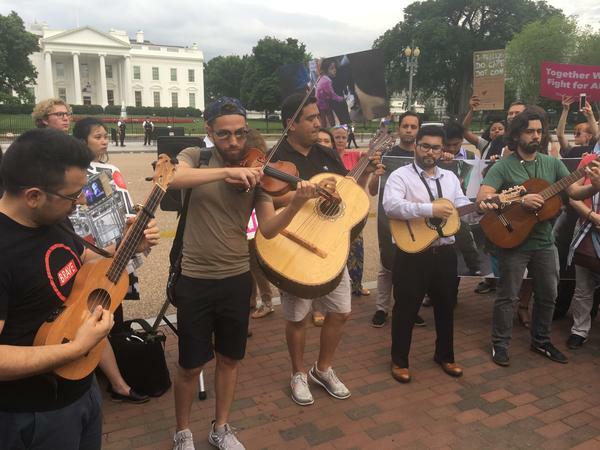 The Washington, D.C., band Elena Y Los Fulanos recorded the song "Amor Migrante" four years ago, telling the story of a mother who has left her home country in search of a better life for her child, even though she has had to leave her child behind. The theme of a mother's separation from her child resonates even louder now. The video for the song features a real undocumented mother who hasn't seen her son in 12 years. "We want to tell the current administration to stop ignoring their direct role in creating this situation," Gaby Moreno says. "They're focusing instead on the cruel [behavior] of immigrants, on border security. But people are fleeing their countries because of social inequality, from gang violence, from ineffective justice systems. So we're here to tell people it just needs to stop. I just want [immigrants] to be received with more love and empathy." NPR's Stefanie Fernández contributed to this story.